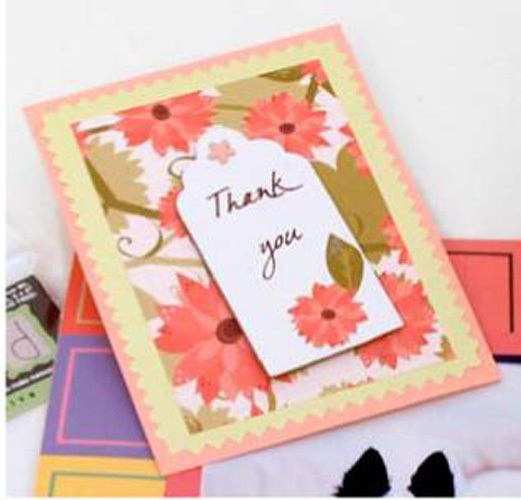 Project Description: Create one of a kind Thank You Cards with Grafix products. Cut a piece of White Chipboard into a tag shape using die cutter or scissors. Tag should be 2” x 4”. Cut pink and sage card stock to 4.5” x 6”. Trim the sage card stock with decorative scissors and layer with the pink card stock. Secure with Double Tack. Cut patterned paper to 3.5” x 5” and attach to the sage card stock with Double Tack. Create text on your computer and print on to the Rub-Onz material. Apply to the tag according to the directions on the package. Cut out a flower and leaf from the patterned paper and apply to the bottom corner of your tag. Punch a hole in the tag and card stock layers. Secure the tag to the card stock using a brad.